RM already presented the first plug-in hybrid crusher at bauma 2013 in the form of RM TWO GO!, where the electric drive was an external option. With the fully integrated hybrid drive in the new RM 120GO!, RM now combines the advantages of diesel-driven and electric-powered crushers without increasing the size of the machine. This delivers full flexibility in the type of drive, maximum mobility, quiet operation, lower emission values, higher performance (because short-term overload operation is possible) and infinitely variable rotor speed over a wide range. The huge advantage is that with RM, the crusher still remains compact. The base frame of the RM 120GO! has only been slightly modified to make room for the electric motor, and the weight of the crusher only increases by 500 kg with the electric motor, so it remains approximately the same. 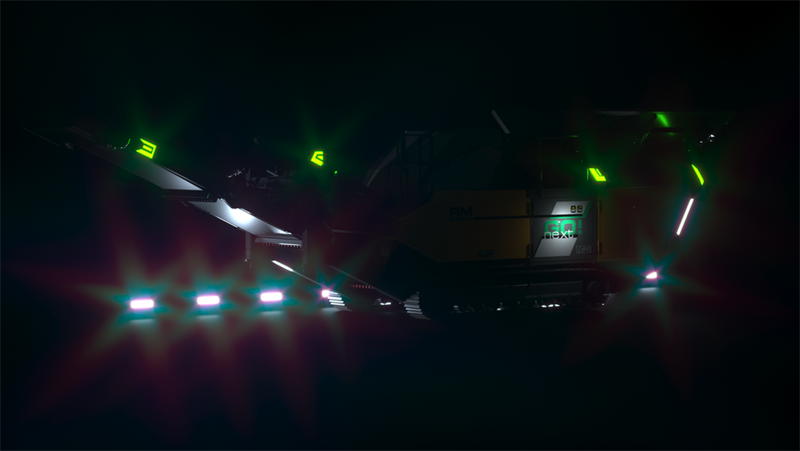 Thanks to many years of experience with hybrid crushers, the new RM 120GO! Hybrid boasts an even more powerful generator and a 50 % larger diesel tank. RUBBLE MASTER can look back on a long tradition and a great deal of experience in electrical drive and control systems technology. Since 1991, RM crushers have been equipped with direct drive diesel engines. While all auxiliary drives on RM crushers have always been driven electrically, only the crushing unit is driven directly by the diesel engine. RM crushers were therefore the first to do without hydraulic drives for belts and operate the vibro-channel and main discharge belt electrically. This has always saved fuel, operating costs and achieved a high degree of efficiency. RM also uses especially optimised components such as more durable generators. This experience in electrical drives and control systems technology led to the design of the first fully electric skid-mounted crusher in the mid-1990s. The RM GO! principle has always meant that RM machines are straightforward and intuitive to operate. RM GO! NEXT sees RUBBLE MASTER take the next step. “Our crushers and screens communicate with the user, either directly using light signals or via the RM GO! SMART app. This will make our machines even safer and even faster as well as easier to service,” says CEO Gerald Hanisch. The first thing that you notice is the new appearance of the RM crusher. This is based on a sophisticated lighting concept. The machine communicates with the operator by emitting light signals. The operator is able to remain outside the machine’s danger area while it is processing. You can then read the details about the performance of your RM crusher in real time using the RM GO! SMART app. What is new here is that throughput data from several weighing points can also be integrated using belt scales, and these can be reset directly using the app. The total throughput and proportion of the screened aggregate serve as an indicator as to whether the crusher is operating at full capacity. Daily reports and error code routines are also included as part of the digital service. RUBBLE MASTER has owned Maximus Crushing and Screening Technology since 2018. Together with the engineers at the Northern Irish company, RM engineers have been working at full speed over the past few months on an absolute world first in the screening sector. This innovative screening system will be presented exclusively at bauma. – Come and experience the world of RUBBLE MASTER at bauma – Stand B2.236!